from the nato's: when daddy comes home. nato has a wierd schedule. so sometimes he gets to come home in the middle of the afternoon. and basically, this is what happens. please notice nato's face in that second picture. painful? and yes, everyone takes a turn jumping off the "fort" as layne calls it. even if the landing hurt their back. poor lila. she was scared, but laughing. layne started mixing it up with some "skateboard tricks". no skateboard needed, i guess. penelope declined the opportunity to jump and instead took a nap. i think this was wise on her part. and where are the pictures of me jumping, you ask yourself. oh please. do you honestly think i would participate in such hootinanny? however you spell that. i'm far too mature for this. and ya. if you must know, i peed on myself a little. ok? also, hells yes...i'm rocking some white shorts from walmart and they are high waisted. so get over it. i'm ok with hiding a few extra pounds in a high inseam. go with it. thanks for the fun afternoon, nato. i love the way you play with our kids. you are such a good daddy. and you're hot in those scrubs. paging doctor nato. just kidding. or am i? yes, i'm kidding. don't get any ideas. you're so graceful. love the pointed toes...that aren't pointed. Also, do you notice that layne is copying daddy and lila is copying momma? presh. Next week try sliding down your steps in a sleeping bag. Equally dangerous and painful, but equally fun I swear. I can't wait til I send Larkin down the steps in a sleeping bag, do you think 3 months is old enough? After seeing this post I kinda with I was one of your children, because those are some good memories mama. LOL... this is amazing. 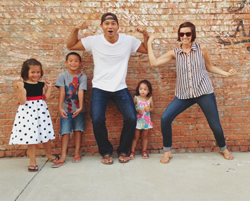 I especially love that you and your hubs look like you are having even more fun than your kids. I love this! Way to jump in there and be a FUN mom! These are the things they will remember! Not how clean the house is, or if the dreser was dusted, or the floors swept. They will remember daddy coming home on his lunch break and momma jumping off the couch! i think this certifies you as the FUNNEST BLOGGER EVER. Oh my my! I do love this for so many reasons! We had forts yesterday too, but no jumping just lots of building, getting bored, mommy cleaning up, and repeat...over and over. we needed a little jumping! This is awesome. Pure fun. ps. I felt like a rockstar when you commented on my blog. You made my day. I love this blog post! All of it. The thrill of an early afternoon home, the fort, your family jumping, and your display of maturity. Three times. Thanks for the smile. oh my. you guys are so adventurous. that makes me nervous just looking at the pictures. plus, i can't jump more than about an inch so i'm kind of jealous. Is Nato really a doctor? Do you guys play doctor? Do you own skimpy matching scrubs? Have I crossed the line? If this is wrong I don't want to be right. You have the special power of making my day! What a fun heartfelt post! Aw.... I just love to see you'll together. GOD BLESS! Cutest family EVER. That picture Nato looks like he's flying. Hahaha! This is awesome. You crack me up. And your hubs has some hops, man. Totes getting up there in the air! First- Go ahead rock those high wasted walmart shorts girl! I just had a baby too and I am rocking my own highwasted version. (Gotta tuck that extra skin/few lbs somewhere!) 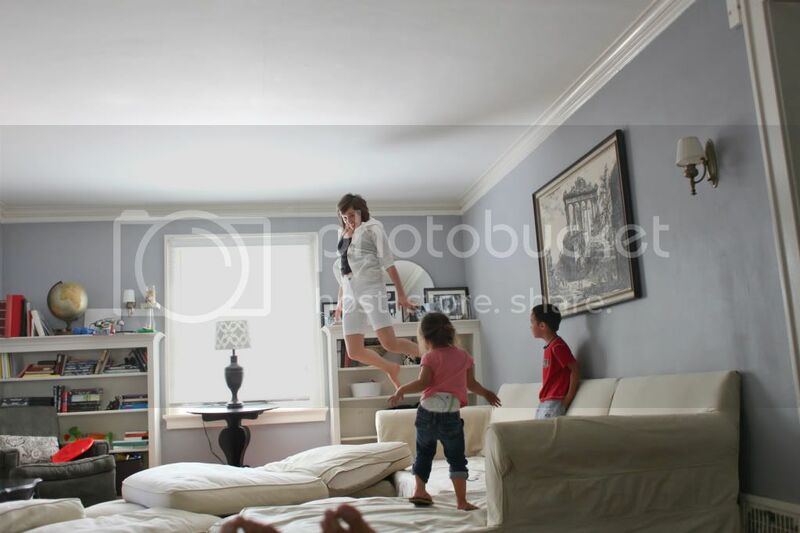 Also- I am promising to myself at this moment to let my kids jump off the couch and have a blast doing it (even though I am an orthopedic nurse and see the broken arms happening)it is totally worth it to see the fun in these pics! Pretty sure Nato could make the running for the next super hero film in that airborne pic of him in his scrubs. Who says all superheros have to wear a mask? oh my word. i'm dying over here!!!! Soo funny and yes I was looking at those rockin' shorts and thinking I need some of those to hide my muffin top! I found your blog through Fingerprints on the Fridge and I may have just read a hundred of your posts. I LOVE your blog. So funny, so real, so awesome. I'm a new follower. l to the o to the l.
He is a good dadddy, how cute and you're a good mommy. I could squeeze ya'll..
Blahahahaha. Reminds me of what the Severn's do...."pillow lake" I believe. 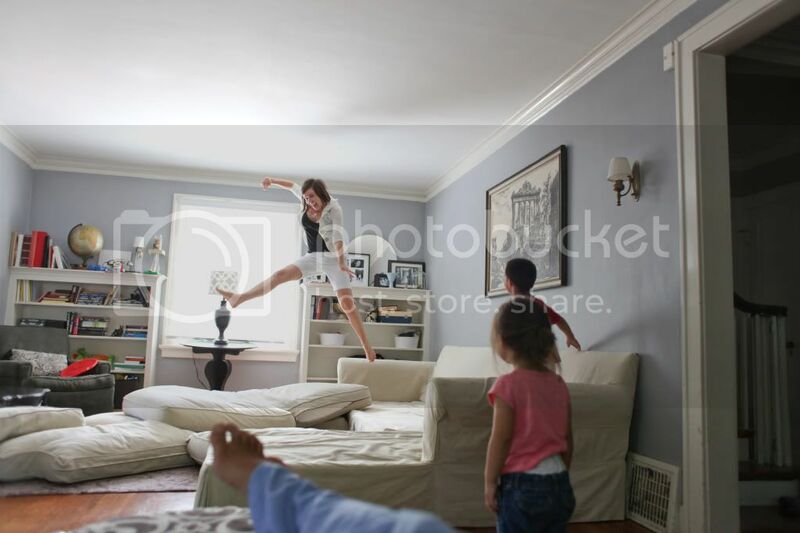 So, my son saw these pics fresh after leaving a friend's house (whose mom also lets her kids jump on the couch cushions) and he was like, "I'm the only one in the whole wide world who doesn't get to jump!" then he hung his head in shame. And I officially lost the little cool mom status I had. Tomorrow the cushions will be on the floor and jumping will commence. A woman has a reputation to uphold. your afternoon makes me feel like the times we dress up our dog in my clothes for a good time is completely normal. i can't thank you enough. for some reason i'm concerned that you are too postpartum fragile to be doing such things. but i guess one is tougher after 3, and i'm also a wuss. ps, thanks, now i know where to get some new shorts for my upcoming rolls! this is my favorite post ever. i can't even explain why. I love that you allow everyone to pull the couch cushions off and jump on to them! I bet you are just such a fun mom! Couple of things.... You and Lila have matching awkwardness going on in that 3rd photo from the bottom. Also you should have taken cue from Lila, you should be wearing a diaper whilst jumping, Lila however looks cute with hers half hanging out, you wouldn't. Looks like so much fun! You are totally rocking those white shorts. Love it. It's worth having to replace the couch at some future date to make these memories. I think they'll know how to be great parents, too. Wrestle time! There's nothing like it! Those are the best memories from growing up and creating them now in our house! I'm not sure how you found my Designs by Sessa blog, but I'm SO glad you did, because you are my new hero! Love this and YOU, even though I don't know you...I just kind of pretend I do anyways! Ha! This is so fun! Pure awesomeness! oh, the memories. I love it. These shots are priceless:) Love the one of your hubby, haha!! Just so you know, I enjoy your high waisted shorts, and the fact that Lila's shorts are not high waisted and her little underwears are totally hanging out. It's adorbs. hahah!! Oh man I love this, you are a mama after my own heart! anywhoo, this post is awesome and i must know, where did you get your couch? Not sure if my other comment posted... So excuse the duplication if need be. 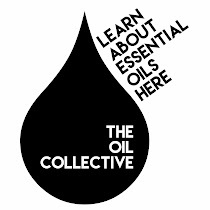 I randomly found(and immediately stalked)you blog! Which explains why i am all the way back in aug 2011! Anyway i love this post and i must know where you got your couch!!! Thanks for sharing!